Sanctuary and Crime rethinks the history of sanctuary protections in the Western legal tradition. Until the sixteenth century, every major medieval legal tradition afforded protections to fugitive criminals who took sanctuary in churches. Sanctuary-seeking criminals might have been required to perform penance or go into exile, but they were guaranteed, at least in principle, immunity from corporal and capital punishment. In the sixteenth century, sanctuary protections were abolished throughout Europe, uprooting an ancient tradition and raising a new set of juridical arguments about law, crime and the power to punish. Sanctuary law has not received very much scholarly attention. According to the prevailing explanation among earlier generations of legal historians, sanctuary was an impediment to effective criminal law and social control, but was made necessary by rampant violence and weak political order in the medieval world. Contrary to the conclusions of the relatively scant literature on the topic, Sanctuary and Crime argues that the practice of sanctuary was not simply an instrumental device intended as a response to weak and splintered medieval political authority. Nor can sanctuary laws be explained as simple ameliorative responses to harsh medieval punishments and the specter of uncontrolled blood-feuds. This book seeks to integrate the history of sanctuary law with the history of criminal law in medieval Europe. It does so by first situating sanctuary law within the early Christian traditions of intercession and penance as well as late-imperial Roman law. The book then traces the transmission of Romano-Christian sanctuary legislation into the feuding traditions of early medieval Europe, showing how sanctuary law was an important emblem of Christian kingship and was integrated into a broad range of social, legal, ecclesiastical and political practices. By the late twelfth-century, sanctuary had been domesticated within the procedures of royal law in England. Unmoored from its taproots in penitential and intercessory practices, sanctuary became a central feature of the emergent law of felony in the early English common law. While sanctuary was widely recognized throughout late medieval Europe, medieval English records provide rich accounts of sanctuary in everyday medieval life and the book reflects the prominence of the English sources. 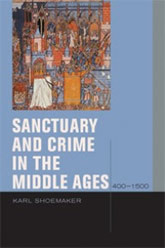 The book concludes by examining the legal arguments in both English and Roman-canonical legal traditions that led to the restriction and abolition of sanctuary privileges in the sixteenth-century and which ushered in a new age of criminal law grounded in deterrence and a state-centered view of punishment and social control.